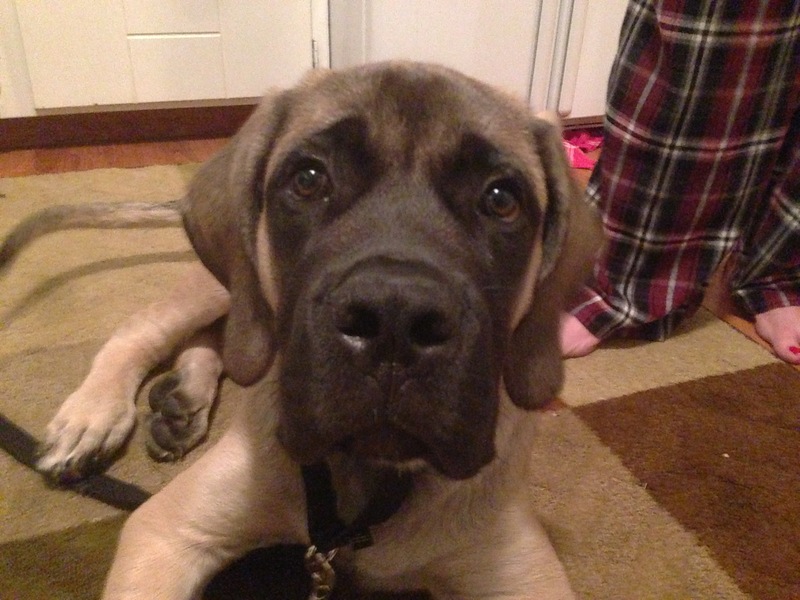 Brewton is a four-month-old English Mastiff puppy who is fearful and shuts down when placed on a leash. When attempting to walk the pup, his guardians have been unable to get him past the driveway to their home. It didn’t take long to see why Brewton’s guardians called me for help. He is certainly a rambunctious little (well maybe not so little) pup who is on the advanced side when it comes to manipulating his guardians. He pawed or barked at them for attention and most of the time his guardians complied with his wishes by giving him a nice scratch or pet. But it was when I saw the pup walk up on top of the family’s teenage son as he sat on a chair that I realized he did not see the members of the family as authority figures. There were a few reasons for this (in addition to his being puppy). They let him up on the furniture and people sitting on said furniture whenever he wanted. When a dog climbs up on top of its handler or guardian consistently, its a classic sign of a lack of respect. Because dogs relate their status amongst the pack by how high they sit, this was a double wammy. When Brewton wasn’t climbing up on the members of his family, he was leaning on or against them. This habit can lead to low self esteem as the dog becomes conditioned to think something is missing if he is not in tactile contact with a human. 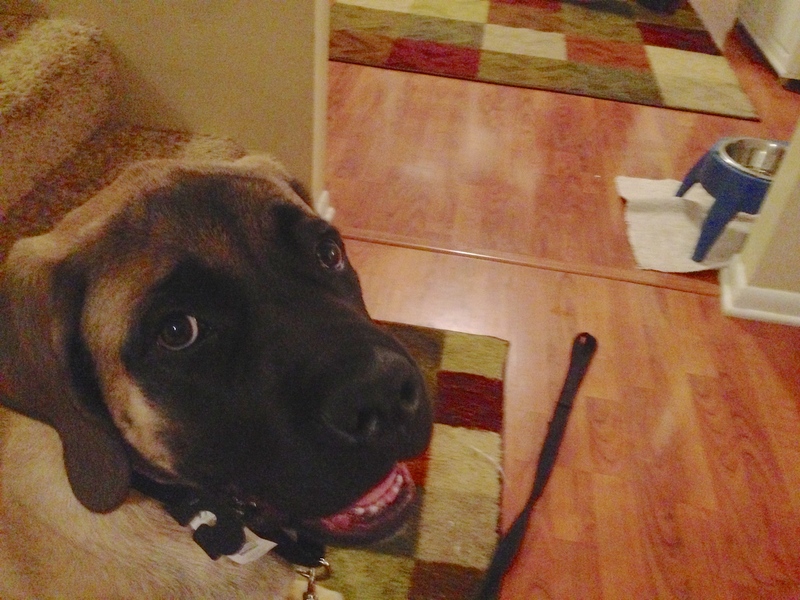 Whenever I have a client that has a large or giant breed, one of the things I try to do is show them how to communicate and correct or disagree with unwanted behaviors without being physical. To many dogs, pushing and shoving is interpreted as playing. Since Brewton’s guardians had gotten into a habit of shoving and puling the dog to correct him, the dog didnt take their intentions the right way. I showed the members of the family how to use their body language, movement and eye contact to communicate what the did and did not want from Brewton. We put this new language to the test as the mother was cooking up some spaghetti (she was kind enough to share some with me, it was spicy and delicious!) while I chatted with the family. To communicate that Brewton was to stay out of the kitchen when she was cooking, I had her stand up and march over in Brewton’s direction with steam in her step. The idea is to walk at the dog with such a brisk movement that it almost startles the dog to get up and move away. As soon as Brewton saw her coming he scrambled up and started to back away from her. I had her continue to march right at him backing him up until he was outside the entrance to the kitchen. Once he was past the border to the kitchen I had her stop and stand in place with her hips and shoulders facing the dog. We waited a moment until Brewton sat down before I had her step away backward so she could keep her hips and shoulders pointed at the pup. After a moment, Brewton stood up and tried to come inside so I had her drop what she was doing and march right at him in a sudden horizontal movement. As soon as she took her second step, Brewton stopped and stayed in place for a moment before sitting back down right outside the entrance to the kitchen. By communicating that he needs to respect the boundary and stay out of the kitchen when directed to do so by his guardians, they will be able to practice correcting him while reinforcing the leader follower dynamic they want. Early on in the session I had slipped a Martingale collar over Brewton’s head and attached a leash that he had been dragging around. Because his guardians didn’t keep a collar on the dog inside, the sensation was a little odd to the dog. I wanted him to get used to the feeling as well as the sensation of the leash being tugged on. I achieved this by leaving the leash on while Brewton walked around. Every time he inadvertently stepped on the leash, he was helping to condition himself to the sensation. Now that we had established some leader follower dynamics and introduced the new non verbal commands, it was time to take Brewton out for a walk. A little earlier I had started to use the leash to guide him away from one of the members of the family who was eating. As soon as he felt the tug on the leash, Brewton let out a yelping cry that caught me by surprise. His guardians told me it was the same sound he made when they tried to walk him. I have run into a number of dogs who learned that they could control a situation by crying wolf and Brewton had clearly mastered this skill. While it may sound like thew dog is dying, the correction was so light that I instantly recognized what was going on. Before heading out on the walk, I filled my pocket with a number of high value meat treats. After I picked up the leash, I took a step towards the door and made a kissing sound while extending my hand with a palm up orientation. To a dog it looks like the human has something in his hand; in this case I had one of the treats. Once Brewton started walking toward me and the front door, I took a few steps myself and only offered the treat once Brewton stopped walking. My goal was to use his nose and the powerful scent of the meat treats to get him moving in the direction I wanted and avoid any tension or corrections on the leash. I had to repeat this process a couple of times to get the dog to the edge of the driveway. This was as far as his guardians had been able to get him and the point that they started to pull on the leash. I showed Brewton I had another treat, then when he came over to get it, I tossed it a few feet beyond the driveway. The dog moved in that direction so I followed keeping the leash completely slack. Once we were past the driveway, I let Brewton do as he pleased. It was a little odd for me as usually Im teaching my clients how to get their dog to walk at a heel on the leash so I discourage sniffing and peeing for male dogs to prevent any marking behavior. But in Brewton’s case, I wanted to introduce him to the fin of being on a walk. So I let him go where he leased, peeing and sniffing whatever he wanted. After a couple of minutes we were a block away from his home and Brewton was getting into the walk. We made a bit of a circle and I motioned to one of his guardians to meet us at the corner. She walked next to us as I led him down the sidewalk. By this point I was correcting him with the leash, but doing so extremely gently. More of a slight tug when he tried to walk into the street. After half a block I handed her the leash then followed next to them offering a few tips here and there. Once we returned to Brewton’s home, I suggested that his guardian take him out for another walk the next day and let him go for as longs he wanted. Usually the handler dictates the direction, pace and duration of the walk. But for the next few walks I suggested that they let the dog do as he pleases so he has a solid foundation of positive experiences on the leash. Once he is more comfortable with it, his guardians can start to incorporate some basic leash training and teach him to walk at a heel. By the time we wrapped up the session Brewton was following the new rules on his own, restraining himself and responding to the new non verbal communication like a pro. He truly is a gentle giant and a smart one at that. It will take a little time, patience and practice, but based on how quickly he picked up the lessons from the session, Im guessing Brewton’s days of misbehaving will conclude the same time the spring does.